Everybody likes fireworks, right? Though I suppose they can be rather loud and annoying. Especially if they’re going off every night for a week. I’m just glad I live in a nice, quiet apartment complex. This entry was posted on Wednesday, July 6th, 2011 at 12:00 am and is filed under Comics. You can follow any responses to this entry through the RSS 2.0 feed. Both comments and pings are currently closed. 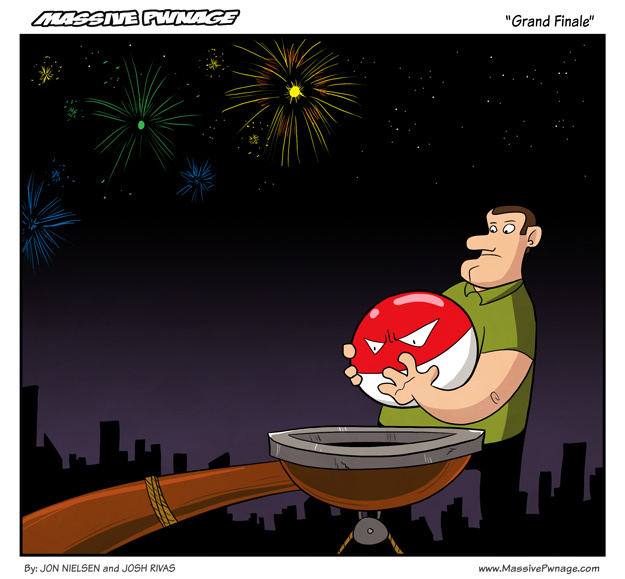 I’d hate to see an Electrode get launched if a Voltorb is the grand finale. Oh man, PETA would throw a fit! I do not understand WHY you had to use a Pokemon???? ?